In order to prevent me being kicked out of the EMMQG, I thought I'd better actually do some quilting, well patchwork at least. I haven't forgotten the Skill builder BOM, hosted by Pile O Fabric that I signed up to, though you could be forgiven for thinking I have considering I have done nothing since March (except basting 13 hexies!). I'd been putting off March's block 6 - woven chevrons - as it looked hard. It actually wasn't. 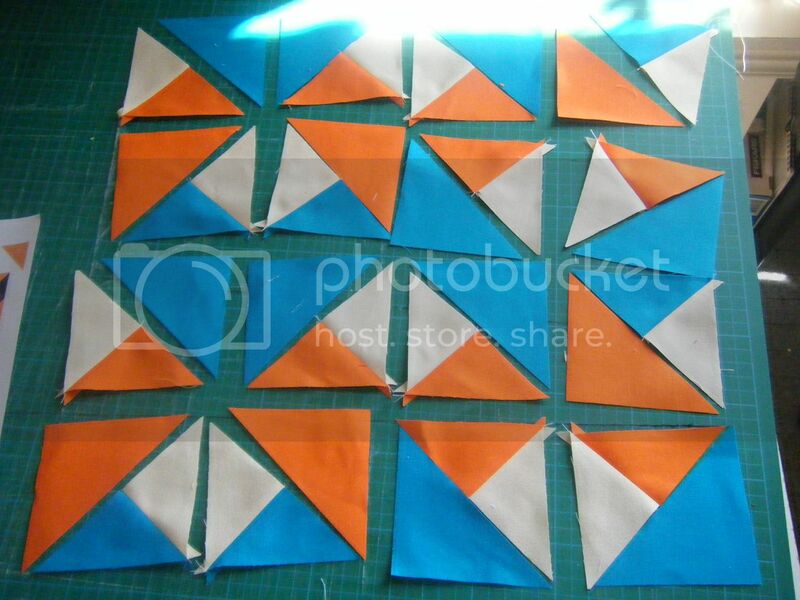 I cut 40 million QSTs and 20 million HSTs* and sewed the QSTs together. So far so good. 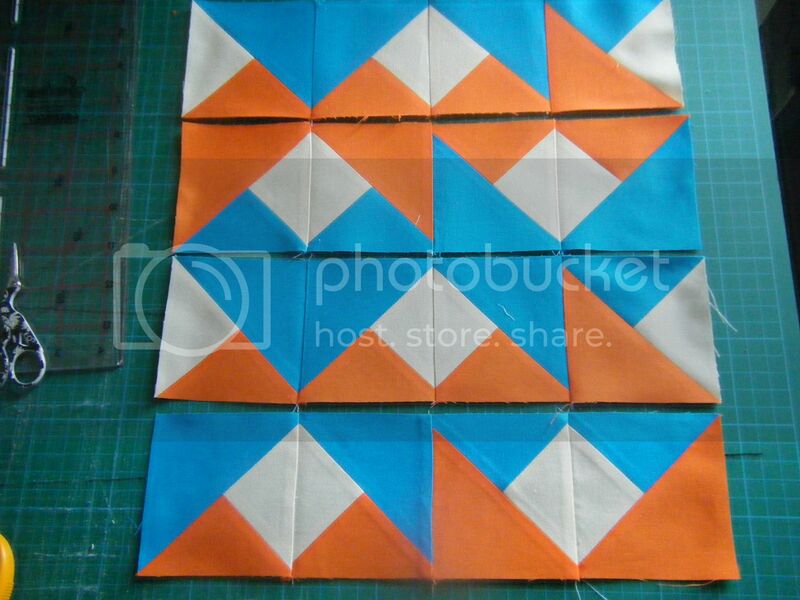 Then I had to sew these pieced HSTs to the HSTs. 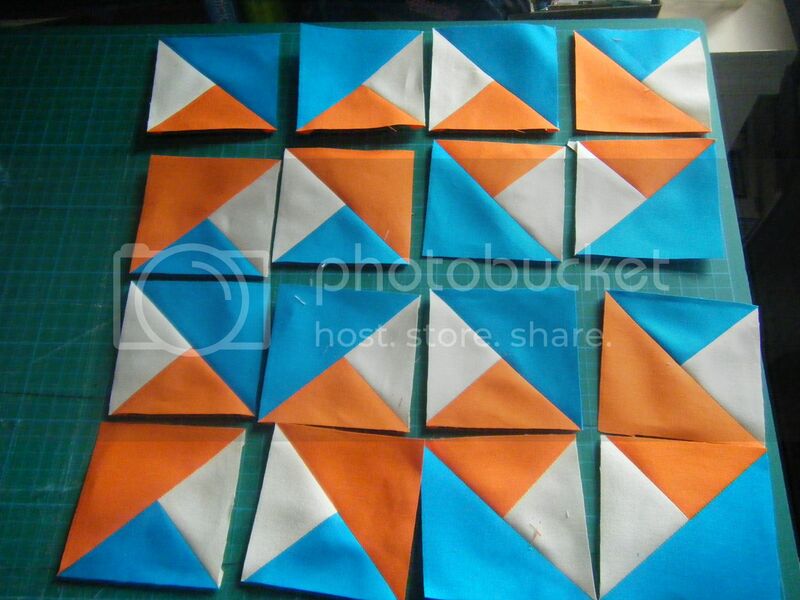 I was pretty sure I'd end up with loads of different sized squares, so I thought I'd better trim them up. Alyssa said they should be 3.5". They were all a fraction over and a quick trim sorted that out. I was stunned. 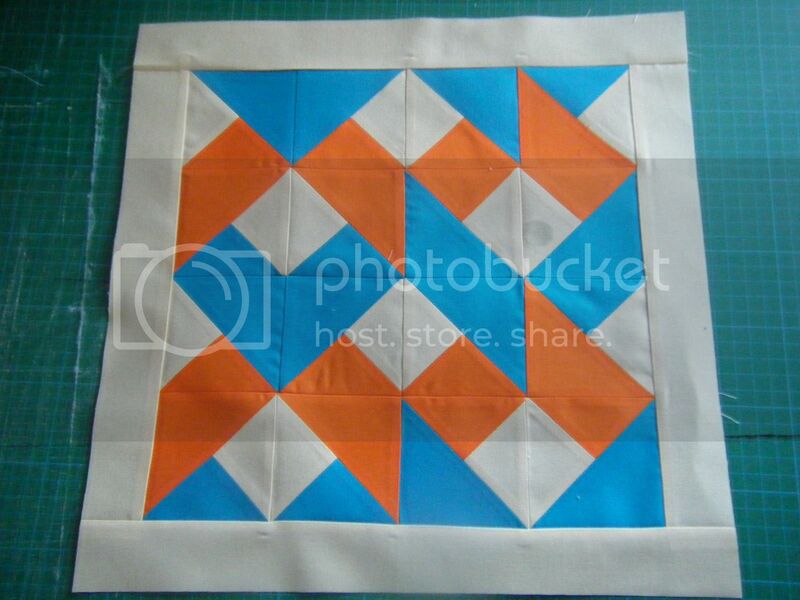 The squares were sewn into rows... all these rows are the same length. Hmmm, something odd going on here. Done. Most of the points match. MOST OF THE POINTS MATCH! So you're thinking "so what", well that's never happened to me before! I know why it's happened, some lovely lady, I think it was Kerry, explained to me what a scant 1/4" seam is. It has changed my entire world. OK, so it hasn't. The house is still falling down, I still don't have a kitchen, I still have to go to work tomorrow, but MOST OF THE POINTS MATCH! It also measured 12.5", just as it should. None of the others did! I added some borders and called it down. MOST OF THE POINTS MATCH! I'll accept your admiration now ladies. 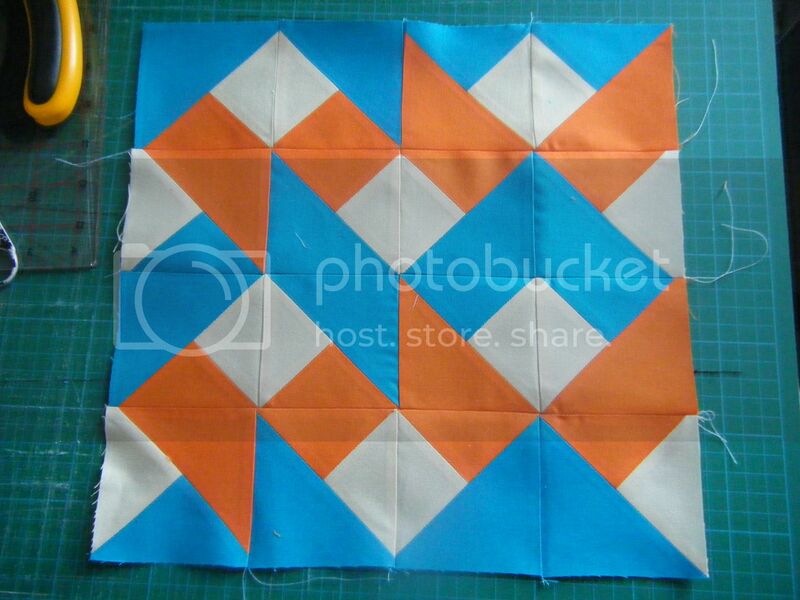 As I'm fairly new to patchwork you certainly have my admiration. Great job, Wendy!!! Love the orange and blue together. I've never really understood scant 1/4"... either it's 1/4" or it's not??? heh, congrats! it looks great! lol. Congratulations on getting most of your points to match. That is an interesting block and good to see most of the points match. It is good to learn something that makes a huge difference even when it sounds such a little thing. Well worth it when the block ends up being the right size, and the points match. hehe. Whoop,Whoop,matching points...you go girl! Love the colors you used for this block. The block looks great! And I get that same feeling every time the points match on a block I'm working on. that is such a cool pattern. It seems like it would be confusing at first. Woot! Woot! Way to go, Wendy! Looks mighty fine, you clever girl. you have it, the admiration that is ;)! Well done! I hope your nearest and dearest (including the bunnies!) appreciate how well those points matched up. If not I think you should tell them just how well they do! As always you have my admiration.